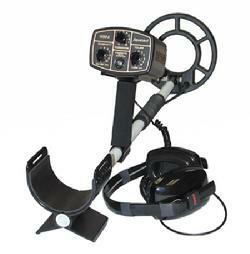 We are factory authorized dealers for First Texas Metal Detectors. These are always in stock and available to purchase in our store and online. Blue plastic hand-held sand scoop. Very lightweight and easy to use. 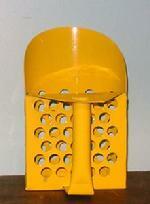 It has 5/8" holes on the bottom and the back of the sand scoop. The scoop is about 9" long by about 6" wide. 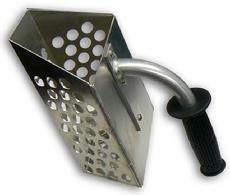 Made of strong galvanized steel and has 5/8" diameter holes through-out the entire scoop body. Comes with a rubber hand grip. Size is 5 3/4" wide x 9" long. Minimum maintanance, like rinsing in clear water after use, is all that's needed to make this scoop last for years of scooping up BIG gold rings. The large number of holes and their size will make the sand flow out very fast. Made in the U.S.A.
Quality craftsmanship makes this sand scoop the choice of serious enthusiasts. This professional quality hand held scoop is designed to provide years of enjoyment. Yellow metal hand-held sand scoop. Lightweight, yet strong for durability. Bucket measures 9�L x 3.5�H, 7�H with handle. � inch holes designed for quick drainage. Hand-held aluminum sand scoop. Rubberized grip. Heavy duty, hand-built construction. Handle is reversible. This is a collapsible travel water scoop.The bucket is 14 gauge non-magnetic stainless steel with holes punched throughout. The handle is also stainless steel. The scoop bucket is almost 9"L x 5"D. There is a round stainless tubing welded on the back of the bucket to the handle. Overall length of this scoop is about 47" long. There is a rubber hand grip for comfort. This scoop is made for shallow water hunting. The water scoop is made with 1/2" heavy galvanized welded wire screen for quick sifting. A flat bar is brazed around the outside of the screen to give the basket support from crushing. The scoop's cutting blade has been designed and cut out on our computerized plasma system. The scoop's metal is 14 gauge steel (.083) & 5" in diameter. The screen and handle are brazed to the bucket a supporting bracket. The handle is 40" long with a rubber hand grip. A very durable, lightweight, easy to use water scoop. Excellent in and out of the water and in wet or dry sand. Made in the U.S.A.
Our most popular sand scoop is made with 2 style handles. A short handle and an adjustable long extension handles. The long handle slides into the short handle & is secured with a spring clip. The long handle also adjusts in 4 positions. These handles are made of anodized aluminum. There are rubber hand grips on both handles. The 4" diameter round basket has 1/2" strong galvanized welded wire screen brazed to it. It is a durable, lightweight scoop made for beach hunting. An excellent sand scoop for dry sand use. Very easy to use with either the long or short handles. Long handle fully extended is about 40" long. The short handle by itself with no extensions is 13" long. 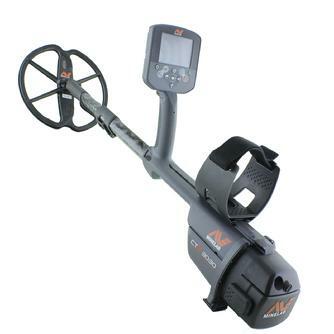 This sand scoop is designed for dry sand hunting only, it is not made for water hunting. Made in the U.S.A. This new scoop has a 5" diameter sifting basket. The long handle slides into the short handle & is secured with a spring clip. The long handle also adjusts in 4 positions. These handles are made of anodized aluminum. The long handle extension has a rubber hand grip for comfort. The short handle also has a rubber hand grip. This scoop can be used with either the adjustable handles attached or with the short handle scoop. Long handle fully extended is about 40" long. This scoop is not designed for water hunting, you can crush the basket if you use it in the water. The short handle by itself with no extensions is 14" long. An excellent sand scoop for dry sand use. 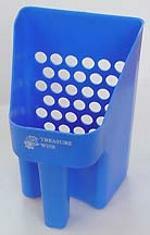 This sand scoop is designed for dry sand hunting only, it is not made for water hunting. Made in the U.S.A.